In order to be able to efficiently deliver these to you all I needed to turn half of my garage into a workspace. That included getting some electrical work, venting, storage, and work tables. That’s coming along swiftly. The general contractor is almost finished with the electrical work and will be installing the venting today. Boxes – They have arrived! Dice Status – Since I was unable to purchase the volume I needed from Chessex (my prototype dice supplier) I had to go find another manufacturer. In order to make sure I get the color’s matching the prototype dice as closely as possible I have to wait for them to do a color sample run and mail that to me. With their lead times and current schedule that means it will be 45-60 days before I have the dice. This is all expected, and is why I have given myself as much time as possible so that I can get the dice correct. It has been a joy to be featured and to work with Geek and Sundry this last two weeks. 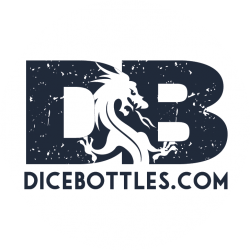 They have really helped to get the word out there about Dice Bottles and I’m excited to keep working with them in the future for other kits that I make. Most have finished their surveys, and there’s still time before the deadline of next week. Backerkit surveys are coming and community suede pick revealed! We’re sending out the surveys soon! After a full week of voting, the clear winner for the $40,000 stretch goal extra suede color is forest green! I’m excited to make it available! Thanks again for all the wonderful support and reaching that stretch goal. Make sure to fill out the surveys quickly so I can know how much I need to buy of each leather color. 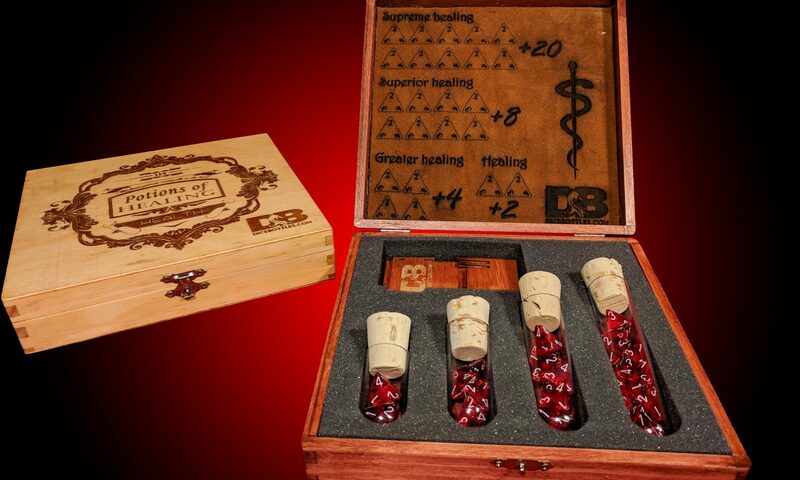 I got the funds early this week and I’ve been busy placing orders for the boxes and vials. The dice order is almost placed, just ironing out some last refinements and then I’ll be moving forward with that. The artist, Chris Berry, has been making huge strides on the art for top of the box and I expect to have a draft soon to show you all. If you’re a backer go and read the update – “Update #16 – Survey Says? Let’s find out :)” . To make sure that only backers are getting a vote in this I’m requiring survey takers to enter their email when they place a vote. If you’re a backer, make sure you use the same email that you use for Kickstarter, or the Facebook account you use to log in to Kickstarter. Thanks again everybody for the support!